After swinging between 2.231 million tonnes and 2.227 million tonnes over a week, China’s aluminium inventory dropped further to 2.216 million tonnes, according to Shanghai Metal Market on April 16, 2018. This is 15000 million tonnes down from 2.231 million tonnes recorded on April 12, 2018. Transactions in major Chinese cities have plunged, as indicated in the below chart. 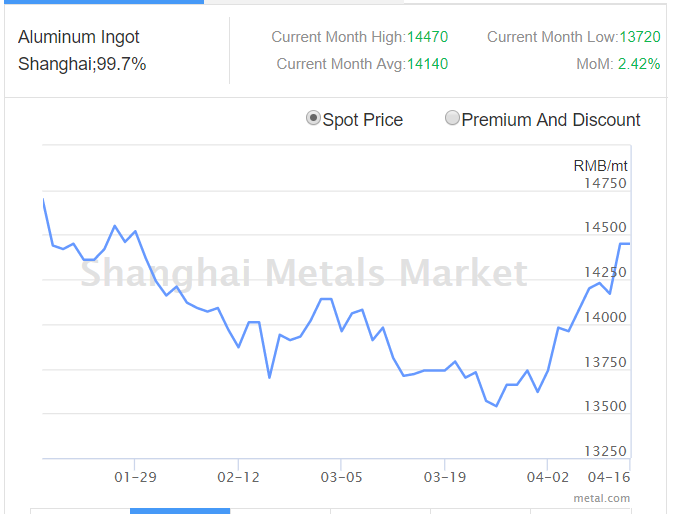 According to SMM, the average A00 aluminium ingot price remains flat since 13th of April, 2018 at RMB 14450 per tonne. This indicates a stable market sentiment with not much shift or alteration. The prices are expected to continue ranging between RMB 14430 and RMB 14470 per tonne, with only a slight swing in spot discounts to settle at RMB 110 to RMB 70 per tonne. While in East the average aluminium ingot price is hovering at RMB 14455 per tonne, as on April 16, 2018, up from RMB 14445 per tonne on April 13, 2018, aluminium ingot price in South climbed from 14425 on April 13 to 14445 on April 16, 2018. However, the price in North-East witnesses a marginal fall from 14400 to 14395 on April 16. 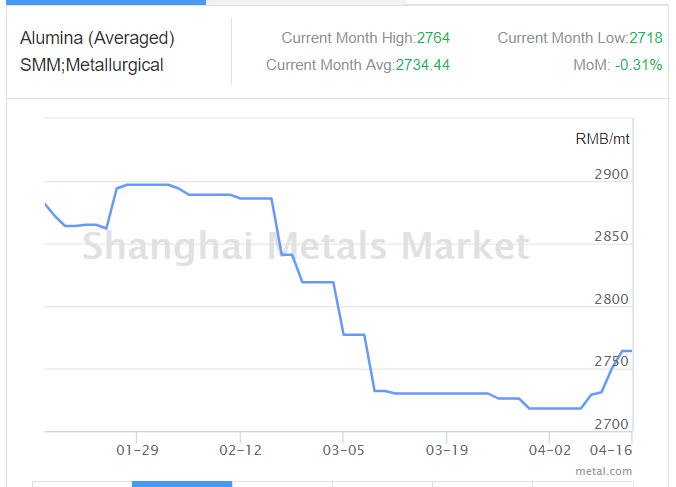 The downstream market also exhibits a steady layout with average alumina price continuing to attain RMB 2764 per tonne from April 13 to April 16, 2018. Prior to this, the price was on a rising spree last week from RMB 2718 per tonne on April 9 to RMB 2729 on April 10 followed by RMB 2731 per tonne, RMB 2750 per tonne and RMB 2764 per tonne on April 11, 12 and 13 respectively. In East, while the price is hovering at RMB 2770 per tonne, in North, South and Central, the price is at RMB 2760 per tonne, RMB 2775 per tonne and RMB 2760 per tonne respectively, SMM learned. On the other hand, as far the input costs are concerned; alloys, bauxite and pre-baked anode are conserving the previous average prices RMB 15950 per tonne, RMB 400 per tonne and RMB 3625 per tonne, as on April 16, 2018. So, considering the average costs of raw materials as well as aluminium ingot and alumina, it can be concluded by saying that China market is performing at a steady pace, exhibiting an overall growth. 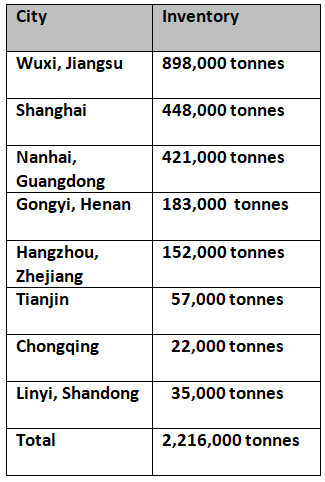 Only China’s alumina export is likely to surge owing to an incessant price hike of foreign items and therefore, an increasing price gap between Chinese items and the latter as a result. Moreover, on the face of US sanctions against Russian aluminium companies, alumina prices are showing an upward trend in the international market. Also, Alunorte’s 50 per cent production cut is triggering an insufficient alumina availability and rise in price as a result, SMM updates.